Venue: Jasper Hotel, 489 Elizabeth Street, Melbourne, Australia. This Conference is a rare opportunity to bring together people interested in understandings of sacred texts, and the experiences of people with disabilities and carers within the context of faith. This multi-faith Australasian Conference has the support of a wide number of organisations including the Jewish Christian Muslim Association (JCMA) and the Faith Communities Council of Victoria (FCCV). The Uniting Church Synod of Victoria and Tasmania is providing the Conference Secretariat. The Conference will draw on the wisdom of all faiths, and will deepen our understanding of the many aspects of disability and spirituality. We are interested in your experience, research, practice, and ideas and knowledge. Among the themes explored will be ethics, care, inclusion in faith communities, friendship, discrimination, love, justice, liberation. 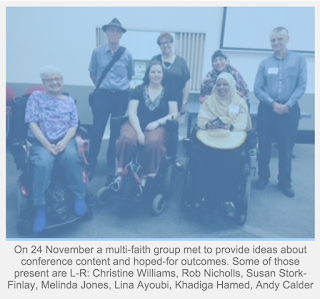 In Australia, and abroad, an increasing number of people are actively exploring the intersection of disability and spirituality. An excellent Conference program will present perspectives across the faith spectrum, with opportunities for dialogue and formation of new networks. It will have appeal to people who live with disability, families and carers, academics and practitioners (volunteers and staff). Two esteemed speakers will be keynoters at our Conference: Prof Hans Reinders is Chair of Ethics at VU University, Holland, and editor of the journal Religion and Disability. Rev Bill Gaventa is Director of the Summer Institute of Theology and Disability and President-elect of the American Association on Intellectual and Developmental Disabilities (AAIDD). We are also delighted that an Australian cast of presenters is increasingly coming on board: Prof David Tacey an interdisciplinary scholar who is widely published for his knowledge of Australian spirituality. Other presenters include Lorna Hallahan, Sheik Isse Musse, Melinda Jones and Diana Cousens (see website Speakers tab for details). There will also be an exhibition of artworks that reflect people’s experience of disability and spirituality, as it relates to the conference theme. The Conference is also seeking Abstracts within these three streams, as they relate to disability and spirituality. Please go to Call for Presentations for details of Abstract Details and Guidelines. Abstracts need to be submitted by 10 April, 2016. Presentations may include formal papers, posters, personal stories, poetry, or other approaches. We invite presentations which address aspects and experiences as they relate to spirituality and disability. Themes include liberation, education, bioethics, reconciliation, sexuality, pastoral care, inclusion, love, theological interpretations. All presenters must be registered for the event by 15 July, 2016. Other sponsors and endorsers include Spiritual Health Victoria, Spiritual Care Australia, Christian Blind Mission, Victorian Council of Churches, Progressive Christian Network Victoria, Australian Catholic University and the University of Divinity. Endorsed by: Faith Communities Council of Victoria, Jewish Christian Muslim Association of Australia, Victorian Council of Churches, Spiritual Care Australia, Spiritual Health Victoria and University of Divinity.